Ok, so I guess I might just have a climbing pack fetish. I'm not afraid to admit it. 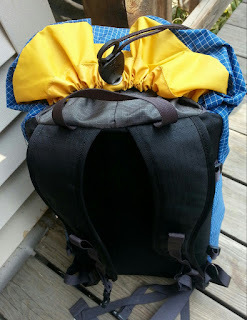 Mostly, I go for highly functional daypacks that will work well across all climbing disciplines. I've reviewed several versions of the Cold Cold World Ozone in past posts. For simplicity, durability, and price the Ozone takes the cake. The fact that you can have it tailor made to your own specifications, with or without things like spindrift collar, axe loops and compression straps makes the Ozone about the best available option. One other worthy contender, especially if you're looking for a low-priced alpine climbing pack, is the MEC Alpinelite 30. Clearance models of the pack are on sale right now at the MEC site for $39 CAD. 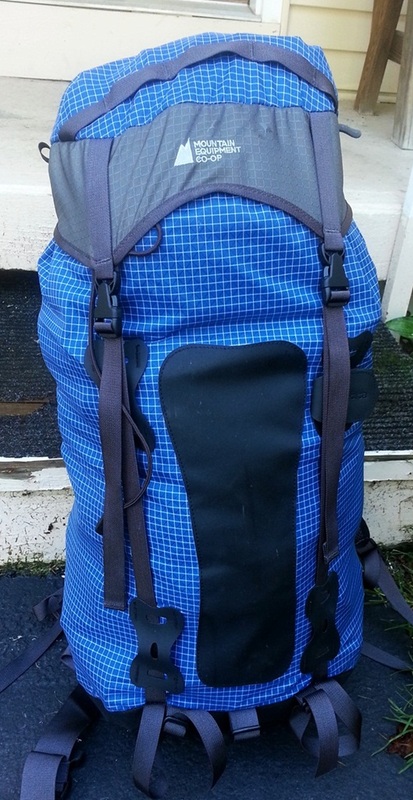 Regularly priced at $54, this pack is worth the money and should last through many alpine or rock trips. At 660g for the standard length, the Alpinelite 30 is also one of the lighter packs available. Since the Ozone is about as good and simple as packs come, I'll be using it as a reference throughout this review. The Alpinelite 30, a nice looking simple bag, is sized similarly to the CCW Ozone (true to size at about 30L) and comes in two different torso lengths. I bought the longer length and it fits my 6'1" body perfectly. The torso length is about 19.5", which is about 1-2" longer than the stock Ozone. The pack is constructed of lightweight 210d dyneema/nylon ripstop fabric. The bottom is 420d nylon for added durability. 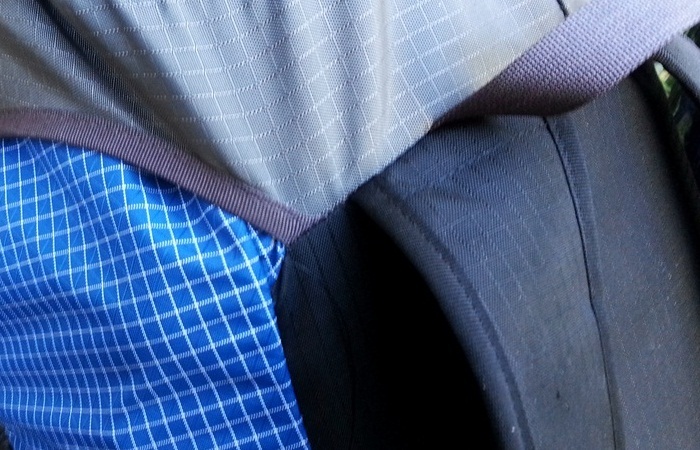 As a reference, my ripstop Ozone is constructed entirely of 500d spectra grid fabric that feels much more burly. The lid on the Alpinelite 30 is fixed and the pack (without backpad) can stuff into it's own lid for easy packing during a longer trip where a small summit pack will be needed. On day 1, as a I unboxed the pack a few of the Alpinelite's weaknesses quickly became apparent. Where the lid attaches to the body is an obvious weak spot. If you repeatedly grab the pack by the lid eventually the stitching will fail. After a while this happened on my old BD Sphynx pack too. The other obvious weakness to this pack results from it's lack of any real frame. It comes with a single sheet of 10mm foam that can be removed to use as part of a bivy pad. With just a single piece of foam as a backpad the pack flops around and is very challenging to pack well. After a bit of tinkering I managed to come up with a method for stiffening this pack. I added a folded piece of 5mm Evazote (you can get this from MEC too, and its the same piece of foam I use in my Genie) sized similarly to the original backpad. I also bought a piece of corrugated plastic and cut it to the size of the backpad. After a bit of fidgeting and folding I was able to fit it inside the sleeve correctly. Now, with 20mm of padding and a full length plastic framesheet this pack has become my daily use pack. The pack has just enough of the right features, and nothing additional to clutter it up. The lid is small, but will hold essentials like a first aid kit, headlamp, knife, tape, and some energy bars. It's actually reversible and if you're so inclined the Alpinelite 30 can stuff into it's own lid for use as a summit pack on longer trips. 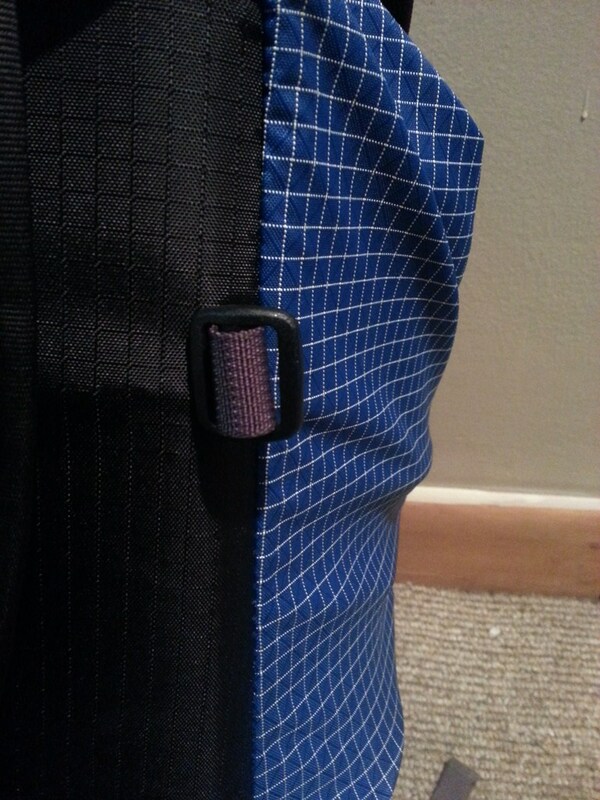 The small uretek zipper does feel a bit flimsy and I can see a repair being necessary somewhere on the horizon. The lid lacks the elastic underside of the Ozone, part of what helps the Ozone pack well and hold a lot. The lid on the Alpinelite 30 doesn't sit as well when the pack is fully loaded. The lid is not removable, but tucks inside the bag easily when you're not carrying a full load. The body is a simple and well shaped tube, which like the Ozone, is made of a single piece of fabric. There are no seams to blow out along the sides of the pack. When the pack is full it will just about rest upright. Like most narrow alpine climbing packs, it wants to tip over when loaded. On the outside several key features make this bag attractive. Two ax loops at the bottom, plus attachment points above allow one to carry two axes, or a shovel handle easily. The ax loops adjust in size, so one could probably carry four tools on the outside if necessary (not that uncommon for me during a normal craggging day - sometimes I bring a set of conventional tools and a pair of leashless tools too). The Alpinelite 30 also has compression straps that are removable. 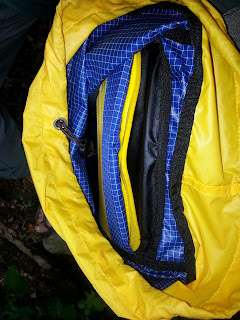 A series of D-rings along the backpad allow full circumference straps to be attached. You can then carry skis, a shovel, sleeping pad or crampons externally. 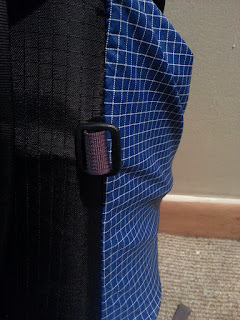 The option to remove the compression straps is awesome, and it seems like a concept all pack makers should embrace. I don't use them 90% of the time and my guess is that most other folks don't either. The strap system on this bag is simple. Like many other lightweight alpine packs, the Alpinelite 30 doesn't have a padded waistbelt. A single piece of 1.5" webbing wraps around your waist. The sternum strap is both adjustable and removable, another nice touch. The shoulder straps feel thin but carrying heavier loads with it hasn't been a problem so far. The Alpinelite 30 seems like a suitable pack to use across all climbing disciplines. It carries a full day or rock or ice gear easily, can carry skis, and could easily make the transition to light alpine overnights. The slightly empty pack will climb well. A single chimney might trash it, but otherwise this is a really versatile pack. I've been using this pack for several weeks now and I'm very happy with it. All in all, it's a nice pack. It holds more than my 18" torso (stock) Ozone, but less than my custom alpine Ozone. However, with a shorter spindrift collar it's much easier to manage the constant repacking at a crag than my alpine Ozone. It feels durable enough to stand up to everyday use, but I know it's not going to last nearly as long as one of the CCW packs. For $39 who's complaining anyways?